It seems every venue and their back-yards are being transformed into a party venue to celebrate NYE this year! 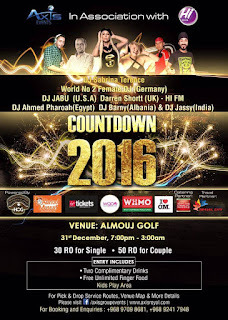 There is one party that's caught my eye this year and that's the Axis Events' gig at the Al Mouj golf course - it's caught my eye because I'm keen to see how the venue will be setup for the night and that it's one of the few all-ages events on offer. World number 2 ranked Lady DJ along with 5 others will be playing from USA, UK, Albania, Egypt and India. 2 drinks and finger foods (cutlet, spring rolls, nuggets, French fries samosas etc) which is included in the ticket but food will be available for purchase if you want more than the finger foods on offer. World class state of the art butterfly line array concert grade cabinet sound system and entire ambiance lighting all over the venue (not sure what that is but seems impressive). Indoor Kids area with lady volunteers,with kids play area and activities like painting and games by trained people to keep them entertained,your mobile number will be tagged to the kid if in case kids want to see you. Pick and drop services provided - from all locations of muscat - no need to drink and drive - not that you EVER should!!!. Seating and cocktail table will be provided (minimal). You can find more info on the facebook event page here too. Everyone finished their Christmas shopping yet? !